Choose a plan based on the number of Users who will require an email signature. Install email signatures on unlimited devices, apps and email software. Select the correct amount of Users that will require an email signature for your business. If unsure, start with our 3 Plan. You can always upgrade your account to a larger plan later if you need to. Love us, or your money back. 7 day money back guarantee. Prices shown in CAD. The service your website provides is exactly what we were looking for and has been easy to use all around! Thank goodness for Email Signature Rescue! After wasting days playing around with other similar websites, I took a chance on ESR. I couldn't believe that less than an hour later I had everyone's individual footers done and dusted (tweaked and everything). I'm so glad I finally found it! I get comments on how great my email signature looks and I love knowing it looks that great for everyone who opens an email from my business. Thanks Email Signature Rescue! Email Signature Rescue was exactly what we needed to create multiple email signatures that look good and are easy to create and update. Would definitely recommend it to other small businesses. Email Signature Rescue has by far been the best solution we have found. What Email Signature Rescue has done to take the heavy lifting out of email signature design is stellar. Keep on doing what you're doing. Love, love, love the new email signature that I created for our business! It looks so professional, and conveys all of the relevant links for our customers to connect with us. Beyond happy! So easy to use and the results are incredible. I have never seen so many people notice my signature and compliment it. I just freshly installed Windows 10, and setting up email signatures was one of the jobs I most dreaded. Email Signature Rescue made this work fun, plus portable to everyone in our organization running different email programs. If your business is growing, you might need more email signatures. Change plans any time. Try us out for 7 days, if you don't love us, we offer a full money back guarantee within 7 days of purchase. Discounts are available to Non-profits, Charity Organizations, Personal Users and Students. What do I get with my plan? You get immediate access to our software to create, edit and manage all your email signatures online. We also host your images, banners, vcards and social media icons. You also get all 20+ professionally designed, coded and tested HTML email signature templates included in our software, you can preview and choose designs while you create your signatures. And finally, you get installation support, online guides, apps and browser extensions to help you install your email signatures in any of our supported email clients. There’s no catch. We include all features on all plans. You just need to select the right plan for the number of users you require. The price is shown on each plan. Annual billing covers costs as we continue to securely host your signatures, images and assets. You can login to edit and change designs at any time and update your signatures. There are no lock-in contracts, you are free to cancel at any time. You can start right now using your Mastercard, Visa or American Express (Amex) cards. Online Payments Secured by Stripe™. We never see or hold any payment details. Paypal is also available. Simply select Paypal during checkout. You can choose from our available currencies above the pricing plans. If you’re a larger Corporation or Government Department and need to pay by Invoice or have other requirements, please don't hesitate to contact us to discuss your requirements. Can I create signatures for multiple companies and different users? Yes, you can use our software to create signatures for multiple companies and users with different images and information included each signature. The images and information you put in each signature can be completely independent of each other, or you can use our Default Images feature and upload images to use across all signatures, it's up to you. We do suggest if you are considering adding mulitple companies higher than 30 users, to create individual Email Signature Rescue accounts for each company, for easy updating of company images across all signatures. Please contact us for discount pricing for multiple company accounts. Why should I pay for email signatures? We don't just offer email signature templates to download and leave you high and dry. Instead we offer online software to save and edit your email signatures, we host images for you, you can login any time to change template designs and make changes to your signatures and there's a whole bunch of other great features that our 80,000+ users now can't live without. See for yourself and if you don't love it, we offer a full refund within 7 days. Do the templates support International Characters/Letters? Yes! Our email signature templates are coded using UTF-8 character encoding which includes all of these characters. So if for example, you need to use Greek or Swedish characters/letters, in your email signatures, we have you covered. How do I install the email signature in my email client/s? Easy! Follow the install guide or video for your email client/s. If your email client supports it, install your signatures using our easy installer apps for Windows and MacOS or browser extensions for Chrome, Firefox and Safari, with automatic updating from the ESR Dashboard directly to your email client. How do I create email signatures for all my staff? First, upload any images that you would like to use across all email signatures to your Default Images folder. Next, create your email signature design. Once you are happy with the design, you can then duplicate that design for each staff member. Each staff member's signature is saved to your Dashboard. When you have finished creating all email signatures for your staff, simply email all HTML files or keys for super easy installation. How do you test your email signatures across all supported email clients? We use both in-house testing and programs like Litmus to test our HTML email signatures, to ensure the design looks professional and stays looking as consistent as possible across all supported email clients. However, when designing the signatures using our editor, you do need to be mindful that adding certain elements can cause issues with the signature looking good across all email clients. We don't like to limit your design freedom, so we have a handy guide to follow if you want to keep your email signature looking great. Can I install the email signature across multiple email clients and apps? Yes, you can install your email signature in unlimited email clients and apps, however you do need to abide by our licensing terms and have one email signature in your account, per user. Are the email signatures responsive? There are only a few email clients that support sending and receiving responsive emails, therefore we don't code our email signatures templates to be responsive. Instead, we focus on designing templates that look good across all screen sizes. If you're wanting your email signature to look responsive, we suggest that you design your template with mobile screen sizes in mind, which is easy to do using our software. Do the email signatures update automatically? If you install your email signatures using our Key method in supported email clients, your email signature will update automatically while logged into your Dashboard and editing your signatures. For other email clients, when you make changes to your email signatures in our software, you will need to re-install the HTML through the settings in your email client. In most cases, this is a simple copy and paste which takes less than 30 seconds. Find out what options are available for installation for your email client here. I'm a Designer, how do I sign up my clients? There are two unique programs for Designers, Affiliates and Resellers. Find out more about the features each program offers here. You can join both programs if you like. We don't currently offer a free trial, but we do offer a 7 day full money back guarantee. Please feel free to try out our software for 7 days and if it's not a good fit for your business, we'll refund your money in full. We have two unique programs for Designers and Agencies. You may be interested in joining one or both. 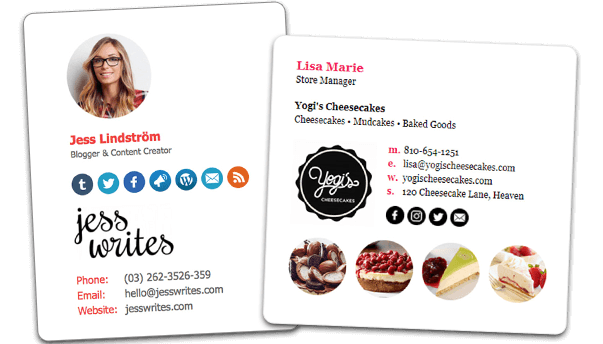 Ideal for designers and agencies that want to refer their own clients to Email Signature Rescue and earn a commission for doing so. Hands off: Send your clients to us using your affiliate link, let them control the signature designs and you earn a commission. Ideal for designers and agencies that want creative control over their client's email signature designs and to use our software and tools to create them. Hands on: you would like creative control over the design of the email signatures for your clients and charge your clients directly. Why join our Email Signature Rescue Agency Programs? Often this is a task that Agencies, Designers and Marketers put in the "too hard" basket, their clients and friends are forced to go find help elsewhere and money is left on the table. We want to help Agencies, Designers and Marketers, who were just like us, create consistently compatible HTML email signatures for their own clients, without the hassle of all the designing, testing and coding that comes along with it. So we've developed our Email Signature Rescue Agency Programs just for you. What are the main differences between Resellers and Affiliates payment models? Resellers get 20% discount on any plan they sign up to on behalf of their own clients using their unique Reseller Discount code. This discount is ongoing, year on year. Affiliates get paid a 40% commission once on sales that you send our way. This commission is a once off payment and does not occur year on year. If you're looking for a hands on approach, to create and manage email signatures on behalf of your clients, choose the Reseller program. If you're looking for a hands off approach, to allow your clients to create their own email signatures, choose the Affiliate Program. If you're unsure or if you think that you might use both programs, join both. How do I join as an Affiliate? Simply select any plan from our pricing page and join. Once you are logged into your account, you can activate the Affiliate program from the settings page and then on each individual email signature while editing. You'll need a Paypal account to receive your commission payments into. Why should I pay to join as an Affiliate? We ask that you join and use the software yourself to become an Email Signature Rescue Affiliate. We like our Affiliates to have some knowledge and experience using the software themselves. We believe that this makes you a better Affiliate, then if you don't know what the software does or how it works. How do I join as a Reseller? To join as a Reseller, simply fill out the application form on the pricing page, under the Designer and Agency Plans tab. Our Support Team will provide you with a unique Reseller discount code which you can use immediately, to start signing up your own clients. Tate is an SEO Marketer and signs up as an Email Signature Rescue Affiliate, as he believes adding email signatures to his services might benefit his clients. Before too long, a client has asks him if he knows anyone who can create a good HTML email signature for his company. Tate provides his affiliate link to his client. The client clicks on the link and is taken to the Email Signature Rescue website. The client signs up for a 30 plan for $279 USD per year. Tate receives a once off commission payment for referring that client to Email Signature Rescue, for 40% of the sale price, which in this case is $111.60 USD. Sarah is a web designer. She has been asked to create new HTML email signatures for a client. Sarah has never coded a HTML email signature or installed an email signature in an email client before, so she enlists the help of Email Signature Rescue and joins the Reseller program. Sarah's client has 8 employees using varying email clients including Outlook 2013, Outlook Office 365, Gmail and iPhones. Each employee requires one signature, plus one more signature for an email address that is used for sending out quotes from a generic email address. Sarah invoices her client $99 USD per year, ongoing, for signature hosting and management, plus an additional $250 USD, once off, for her time initially creating the email signatures on their behalf with our software. This amount could of course, be whatever amount Sarah would like. Sarah's client pays the $99 USD fee and the $250 fee and Sarah provides the signatures she has created using our sofgware in a zip. She also emails her clients install guides for each of the email clients the use in a whitelabel PDF. 1. Login to your Email Signature Rescue Dashboard. 2. Once logged in, click on Hi, Username in the top right hand corner. 4. Go to the new Earn Money tab. 5. Turn on the Affiliate Program to activate it for your account. 6. Fill in your payment details (you'll need a PayPal email address). 7. There's some other options here. You can turn the affiliate link on for all email signatures in your account, or your can activate individual signature affiliate links, one at a time by editing that email signature and following steps 9 and 10. 8. If you turn on affiliate links for all email signatures, you can design the link here and you're done. Then go to edit an email signature of your choice. Check out the preview of the new affiliate link at the bottom of your signature! Now you're ready to install your signature in your email client. 9. If you want to setup individual email signature affiliate links, you'll need to choose this setting in the Profile > Earn Money tab first. Then edit the email signature you want to include a unique affiliate link on. You can have some email signatures with affiliate links and some without, it's up to you. 10. Turn on the affiliate link per signature while editing it by going to the Affiliate tab and turn on the affiliate link. Add the details requested, design your link and you're done! See the preview of the new affiliate link at the bottom of your signature. Now you're ready to install your signature in your email client. Now sit back and let your email signature do all the work! If anyone clicks on the link in your email signature, visits our website and purchases a plan, you'll receive a 40% commission on the sale! How good is that?! You can also use your Affiliate Link on your website, in emails and on social media. You can grab it from your Affiliate Dashboard once you have activated it in your account. Non-profit or Charity: Please use code K7X99H38 for 20% off our pricing plans. Student/Education: Please use code 2SWM8PP5 for 20% off our pricing plans. Personal User: Please use code 7E2CT39K for 20% off our pricing plans.